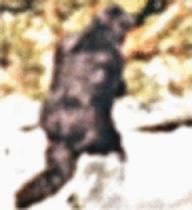 Forty-six years ago Roger Patterson and Bob Gimlin had their incredible encounter with an apparently female Bigfoot at a specific site at Bluff Creek, California, on October 20, 1967. At the International Cryptozoology Museum over the weekend, I was talking to a genetic scientist from Harvard, and shared with him my notion that there is not “one piece” of evidence for Bigfoot’s existence. Instead, I told him I see this more in terms of the “pancake analogy.” That is, there is one piece of evidence after another stacked up to suggest to me – despite the pieces of bad data in the overall database – that a population of as-yet-unknown-confirmed-to-zoology, bipedal primates inhabiting, specifically, a region stretching from northern California to southern Alaska. 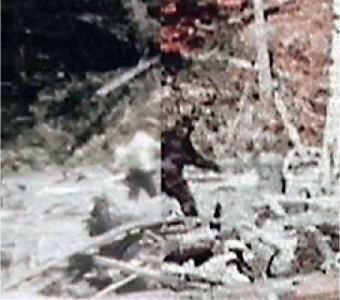 The Patterson-Gimlin footage is the best evidence we have for Sasquatch/Bigfoot who live, allegedly, in the wilderness areas of North America. Why do I think the encounter’s resulting footage is authentic? 1. The event occurred in an area known for Native/First People’s traditions of these forms of higher primates, locally called Oh-Mah, perhaps as long as 500 years. 2. There are contemporary sightings, from the 1950s, here (in spite of the mischief of Ray Wallace and his associates). 3. 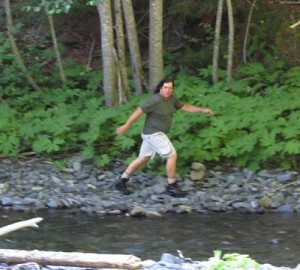 In this specific incident, the cryptid Bigfoot was seen. 4. The Bigfoot was smelled. 5. The Bigfoot was sensed by the horses. 6. A trackway of at least ten prints was found, the tracks casted and preserved – via film and in a physical state – for others to analyze. Such examinations reveal flexible, animate feet for this cryptid, known locally as a Bigfoot (and referred to as Sasquatch farther north, in Canada). 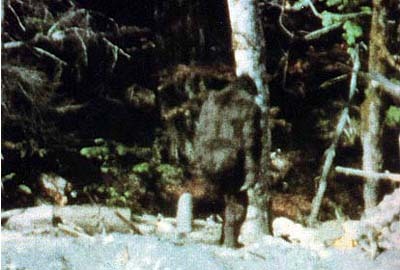 John Green’s 1968 recreation of the PGF on-site at Bluff Creek, featuring Jim McClarin walking in more or less the same track-way as the Bigfoot Patterson-Gimlin film subject. 7. The apparent animal was filmed, and analyses of this footage by Americans, Canadians, Russians, and others verify this was an authentic, probable unknown living primate. 8. The biological mechanical evidence of independently moving, flowing (e.g. 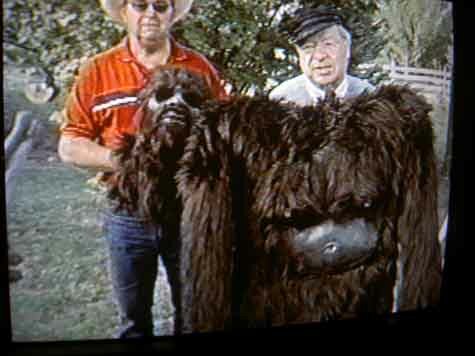 swaying, swinging) breasts on the filmed Bigfoot was not technically possible and does not appear in any gorilla or ape suits produced in the 1950s-60s for movies, carnivals, sideshows, or circuses. 9. 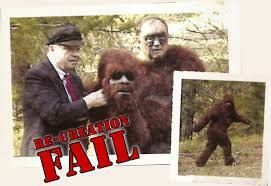 Highly funded attempts by a wide variety of film production companies have failed to to re-create a form-fitting suit in any way matching the Bigfoot filmed in 1967, for contemporary documentary, film, or television programming. See The Bigfoot Show for more about the above. 10. Elaborate and casual hoax claims have all fallen apart under critical investigation, and not been able to overturn the possibility this footage genuinely shows an unknown hominoid. Loren, you maybe can answer this for me. One thing that bugs me in the PG film is the lack of definition in the foot in the still frame that you have at the top of this post. I can see no discernible toes, or any arch or mid-tarsal break. Also, the bottom of the foot seems very white for a barefoot walking primate. Maybe this is from multi-generational copies, color alterations made to show greater clarity, or just the fact that it was 1967 handheld film quality. I just wondered if this had been addressed. I’ll let others talk here, Chad, about the many discussions regarding the loss of definition that occurs with regard to enlarging the PG footage. But on the whiteness of the foot, let me just quickly note this: It has been rather well-established that the dusty blue-gray fine clay dust at Bluff Creek sticks to and appears “white” on the bottom of feet there. Update note: The PG footage’s Bigfoot, despite being slumped forward with bent legs and a sometimes bowed head, appears to be taller than the 6 ft 6 in (in boots) height of Jim McClarin (in some frames). It’s as incumbent upon hoax claimers to prove the hoax as it is on proponents to prove the animal. Far, far easier too, I might add. That this hasn’t happened in over 45 years, and that no attempt either to duplicate or to prove the hoax is anything less than laughable, is telling. It does no good for skeptics to constantly fall back on the “extraordinary proof” canard when addressing proponents on this film. They have made a specific, very extraordinary claim, and must be held to proving it or accepting that science has something to resolve here. Whatever the truth behind this film, I think there is one mistake many skeptics and believers alike make. Many approach this film as though the existence of sasquatch is predicated on whether or not this film is real. 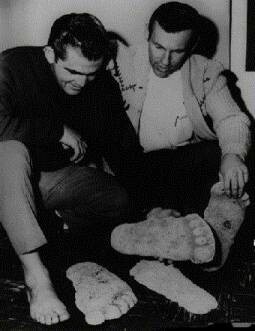 The PG film should be taken as an important piece of the modern history of bigfoot no doubt, but not the be-all, end-all discussion. There are plenty of reasons to consider the existence of an undiscovered bipedal primate in the Pacific Northwest other than this film. Thanks, Loren for clearing up the foot color. I have seen compelling evidence on many different television shows and online that point to this film being genuine. I also have not seen a lot of evidence to suggest otherwise. Even those who claim to know it was a hoax, when pressed have been unable to prove that claim. I just wanted to ask a couple of the questions I have always had about the film. And I will also ask one more. Probably the thing that has always bothered me the most is the “ski mask” appearance of the face. The forehead and mouth seem to be covered while the eyes and nose are exposed. This seems strange looking to me, and I have never really seen it addressed. I just wondered if there were theories out there, like maybe they have facial hair like orangutans? I think one of the most interesting aspects of the “layers” of the pancake is that they were not led with. What I mean is, nobody said when the film was released “hey, look at that funny gate, look at the shine on the fur, hey, it has breasts!” It was all just “ah, that’s just a guy in a suit.” The interesting stuff came out in the review process. Which in retrospect is probably the right way. I have not heard a single valid, non-conclusory criticism of the film, i.e. “it’s just a guy in a suit” or “P and G were flimflam guys.” What I have heard is unscientific, Clarence Darrow type character assassination, and/or hearsay. What I also have not heard, though someone probably has made this point, is that if it’s fake, it’s a darn good one take shot (two, if you count the second walk into the trees footage). I also don’t recall anyone using the “Blair Witch, Cloverleaf” style camera shake back then. To clarify, and I’ll get conclusory here, if a film maker back then was going to take a shot to make millions and prove bigfoot, he would have had a more stable, more crafted look to the film. Something like the WWII footage that was abound back then, and though live, is much more stable. Again, not exactly science, but seems to make sense. Those pancakes look scrumptious. But an equally good analogy used by the other side is that of “lukewarm coffee”. Something to the effect ‘combining a dozen cups of lukewarm coffee does not create a pot of strong coffee’. I personally think that analogy applies to UFO sightings – hundreds of accounts of lights in the night sky does not mean we are being visited by star beings. I would *almost* put Bigfoot in that category minus the PG film, thank goodness for those guys. Stack the pancakes as high as you want, but the Patterson-Gimlin film can never be accepted as anything other than inconclusive evidence for the existence of bigfoot. And I only need one pancake. The original 16mm Kodak Cine-100 home movie camera that Patterson used was a rental so it was never be examined and tested. This point is critical since that model, the the 16mm Kodak Cine-100 home movie camera was notorious for its inaccuracy of film speeds. (Look it up). Patterson stated he normally filmed at 24 frames per second, but didn’t remember the camera’s setting that day. It also had settings of 32, 48, and 64 frames per second but those settings aren’t relevant, just the only one lower than 24, at 16 frames per second. Analysis after analysis by believers and skeptics alike always echo what John Napier wrote long ago. “If the movie was filmed at 24 frame/s then the creature’s walk cannot be distinguished from a normal human walk. If it was filmed at 16 or 18 frame/s, there are a number of important respects in which it is quite unlike man’s gait.” Why he mentioned 18 fps back then is a mystery to me unless he was also aware of that particular cameras notoriety for frame speed inaccuracy. 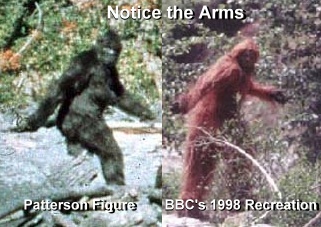 So since the exact camera used by Patterson can never be examined, whether it was at 14,15,16,17,18 or 22,23,24,25,26 frames per second there are actually TEN versions of the Patterson-Gimlin film and all ten are equally likely to be the genuine speed. You want to believe? Then you choose the lower speeds or if you’re a skeptic you choose the higher ones. However, without the original camera no one will ever know know which of the ten possible speeds is true. Not the believers, nor the skeptics. Interesting? Fascinating? Compelling? For sure. But without the camera, forever inconclusive and strictly in the eye of the beholder skeptic and believer alike. The Museum looks wonderful, btw.